An area of Tokyo, Shibuya is one of the busiest sections of city in the world, which is a bit of a problem when it suddenly finds itself cut off from the outside. Giant glass walls, reminiscent of both Stephen King's Under The Dome and a massive fishbowl have raised themselves around the district. Even worse, that giant glass fishbowl is now filled with giant goldfish. With a taste for human flesh. 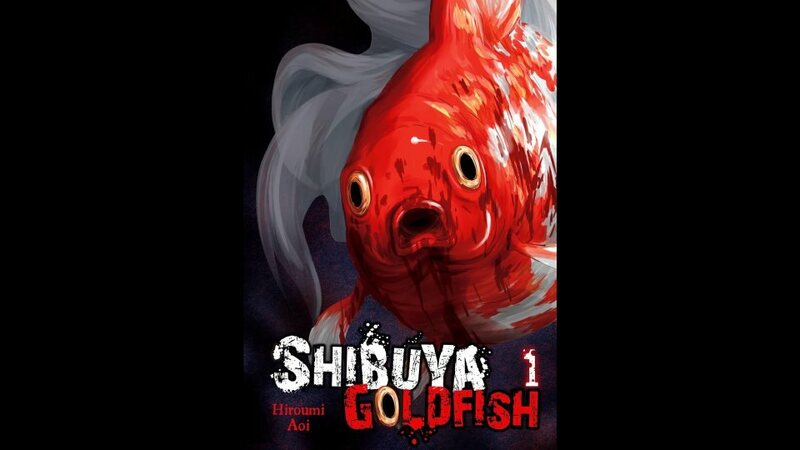 Yep, this is a horror manga. The goldfish can swim through the air as if it were water, which makes them rather good at hunting down their human prey. And they come in a range of sizes, from tiny beasts that are able to slip through tiny cracks or into people, up to enormous behemoths bigger than planes. And all of them talk. They always sound worryingly cheerful. Obviously the fish on their own wouldn't make up much of a plot, so we follow the journey of various people who are trying to escape the confined area. Since this is in the vein of zombie horror, they're not all going to survive, and who gets picked off is always a bit of a surprise. Our main protagonist is Hajime, a film-making obsessed lonely student who has finally found himself a date, just after the end of the world begins. The cast of characters are reasonably diverse with a few outliers who offer the necessary internal threat, and a couple of them have some interesting secrets that might cause the group's escape attempt to go horribly wrong. This story artfully sets up some of the twists so that you'll never see them coming. It's a weird enough premise that if I didn't have set myself the challenge of reading more first volumes I probably wouldn't have grabbed it, but I'm glad I did. It ends up in a very different place than I expected, and I enjoy the sneakiness of that. The art is mostly workmanlike, but has a certain beautiful grimness in some of the more horrible scenes.